24 activities to plan with your family and business future. 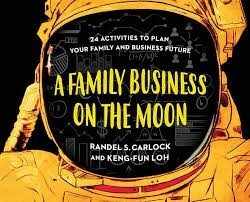 The reason that many family businesses do not plan for their journey together is that the process is time consuming, dangerous, and complex. Based on more than 20 years of teaching and advising business families around the world, this activity-based fieldbook is designed as a rigorous planning tool. It teaches the professional planning skills required for any business family to become a multi-generational team driven by planning, passion, and purpose.